Well, this was an interesting evening. We apologize to the good people of Green Bay who braved the cold expecting an enjoyable night of pleasant music only to find us stuck in the mix. We were put on this bill at the last minute with the kind help of Jim, whose floor we ended up sleeping on later that night. 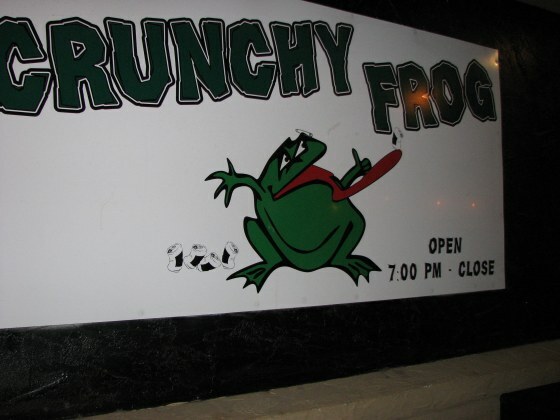 Crunchy Frog was a night little bar on a strip in Green Bay filled with typical Wisconsin style taverns. 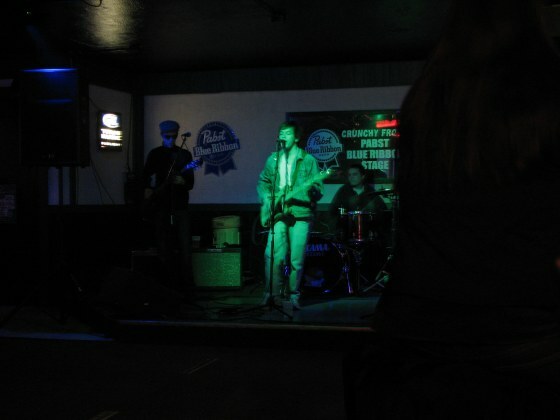 From what we were told, this is perhaps the only bar in Green Bay where you can see live underground-type bands. This was amazing. 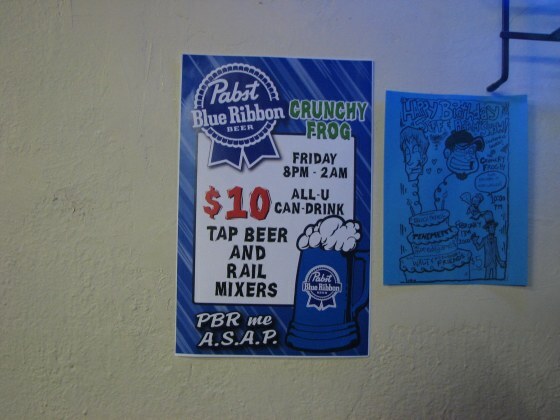 $10 all-you-can drink specials on Friday nights. 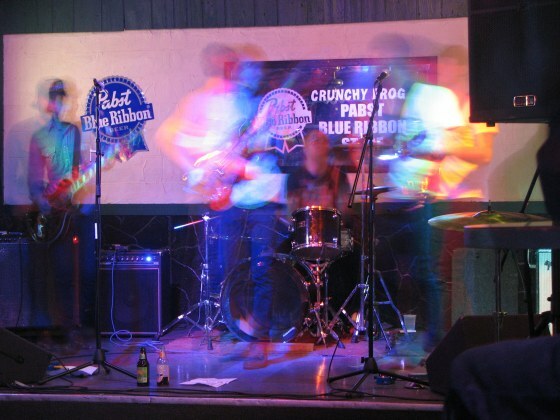 Needless to say, this is the key reason why Crunchy Frog does not do live entertainment on Fridays. 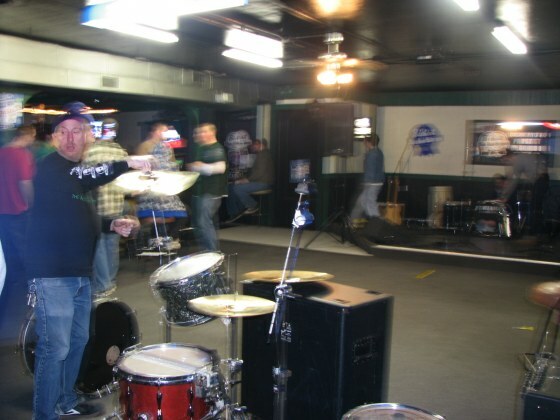 Here's Tony setting up his drums. The opening band was The Ian Olvera Trio (they may have changed their name… they definately weren't a trio that night). They played rock music and their set lasted over an hour. After which they proceeded to break down the drum kit on stage. I guess things move a little slower up north. Paul made a surprise appearance. Thanks Paul! We played our set next (no pictures). Each song ended with complete silence in the room—barely even a smattering of courtesy applause. Oh well, you can't win 'em all. Next came Madison, Wisconsin's Blackwell Beauties. They were a self-described power-pop band. I liked that a few of their parents were in attendence. Nonagon is, if nothing else, a family values band! After Blackwell Beauties Beach Patrol played. We loaded up the van and took off before the end of their set. I know, I know... not cool, but, we were pretty exhausted and needed to wake up very early if we were going to return the rental van without penalty. At least we got to see Jim's awesome vintage bicycle collection before retiring for the evening. Yum! Crunchy frog! I want some too. What do they do? deep fry em'? I think this is a Monty Python reference. I think I am a nerd.